Richard Graef was born in Minneapolis and grew up in the Chicago area. The son of a flutist with the Chicago Symphony Orchestra, Graef received his B.M. degree from Ithaca College and has studied with John Covert and Gail Williams. Before joining the Indianapolis Symphony Orchestra in 1991, Graef was a member of the Honolulu, Memphis and Natal symphonies. Graef has also performed with the Cincinnati, Houston, and Lyric Opera Orchestras. 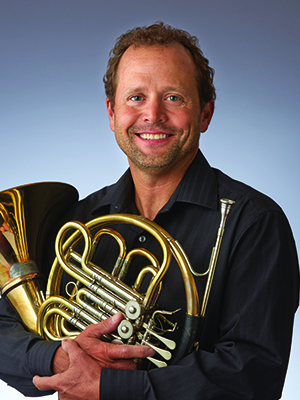 As a soloist, Graef has performed with many orchestras including the Chicago Symphony Orchestra and Indianapolis Symphony Orchestra. Graef is also an active chamber and studio musician. He has served on the Orchestra Committee, including several terms as Chair, as well as committees for the Music Director search, touring and musician pensions, as well as the ISO’s education programs. Graef is a previous winner of the ISO’s Patch Leadership Award and Alice Akins award along with being named an outstanding young alumni from Ithaca College. When not performing great music, he can be found racing sailboats on Eagle Creek Reservoir, The Great Lakes or the Pacific Ocean.